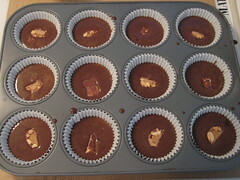 I found a recipe for candy cupcakes and it said to chop the candy and stir it into the batter. 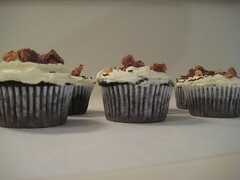 Since I’m not a huge fan of crunchy cupcakes, I had the brilliant [at the time] idea of chopping the candies into thirds and putting a piece directly in the batter, like I did for the cookie dough cupcakes. Unfortunately, I didn’t take into consideration that the heat from the oven would melt the chocolate and caramel, thus causing it to stick to the bottom of the wrapper. Ooops. I’m pretty sure my coworkers will still eat them. As you probably did not notice, although I feel the need to share anyway, I now have a Flickr account solely for this blog, which can be found here. This means each recipe is sorted into its own set, and all sets of the same type of recipe are all part of a collection. Did that make sense? Maybe this will make it easier. Yes, I am slightly obsessive when it comes to organizing things. I’ve moved most of my baking pictures over, but I am still in the process of adding captions and recipe links, so in the meantime, all of the previous posts still link to the pictures on the old Flickr stream. Those look SOOOOO good… Ugh.. Really, come on… Are you suuuuuuuuuuuuuuuuuuuuuuuuuuuuuuuuuurrrrrrrrrre you don’t do weddings???? Krystle…email me, do you have a wedding coming up?